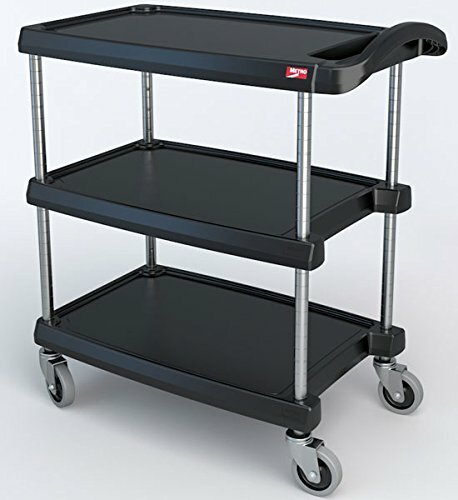 MyCart, are polymer utility carts consisting of 3 high-density polyethylene, injection-molded shelves and 4 chrome-plated posts. Handle shelf will have an integrated utility tray with a base width of 1.8-2.2inch (46-56mm) and coved corners. Flat shelf will have a built in 3inch (76mm) cutaway. All shelves will have a built-in 7/16inch (11mm) deep ship’s edge around the perimeter. 2-shelf cart design is such that user may add an intermediate shelf if deemed necessary that adjusts on 1inch (25mm) increments. Cart will include two nominal 4.625inchLx.88inchH (117.475 x 22.352 mm) labels for easy identification. 4inch (102mm) swivel caster: Thermoplastic, non-marking gray tread. Plated horn and axle. 18 5/16inchW x 31 1/2inchL x 35 1/2inchH, 400lb load rating per cart, Color - Black. If you have any questions about this product by Intermetro Industries, contact us by completing and submitting the form below. If you are looking for a specif part number, please include it with your message.